of carbs and 24 grams of protein. Try our delicious, guilt free SkinnyMe protein snack bars with only 6 grams of net carbs! 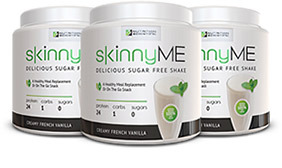 Featured Product SkinnyMe Shake Has Arrived! Get ready to taste the most amazing sugar free protein shake, 0 sugars, 1 gram or carbs and 24 grams of protein. It’s absolutely delicious. Insul-3X is a natural dietary supplement to help suppress the effects of sugar and processed carbs. ProDigest-7 helps replenish good bacteria in your gut beneficially supporting optimal digestion and immune function. Give your body the fighting chance it needs to promote optimal heart health. CLA Premo is designed to help boost fat metabolism helping you get a flatter belly. Your purchase today helps support children in need at the Save the Children Charity. We manage our own affiliate program. Earn per sale, per lead or revenue share.